Keen and I are longtime Pokemanics and have been glued to our 3DS’ since yesterday morning. We make the vow to catch them all every time a new game comes out and mean it each time, even if we end up running out of steam along the way. We’re not terribly far yet but we’d love to talk about some of the more interesting aspects of the games, which seem to have taken the most significant steps in expanding upon the main Pokemon game series. + The 3D rendered visuals are fantastic and allow for some interesting new camera perspectives that we haven’t seen before in the main series. 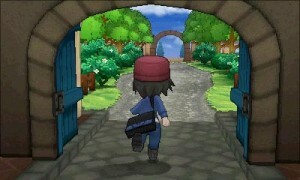 One in particular that comes to mind is when you enter Lumiose. The camera switches to an over-the-shoulder perspective and presents the whole city in an exciting new way. Also, seeing your Pokemon battling in 3D for the first time in the main series is really exciting.+ Rollerskating is a neat way to switch things up from the usual bike transportation. + Fairy type Pokemon! I don’t have a lot of experience with them yet but new types are always fun. I don’t think we have had a new type since steel and dark, if I can remember correctly. + Mega-Evolutions?! Or at least the idea of them. In theory it sounds pretty awesome but neither of us are far enough yet to know. + New features! There’s a new strength-training type minigame system that so far is a bit confusing, the Pokemon-Amie feature that lets you interact with your Pokemon similar to Nintendogs, and probably a lot more stuff we haven’t even seen yet. + Character customization! You can choose between 3 different pre-set characters, either male or female, but later on you can change your outfit, buy new clothes and accessories, and even get a new haircut and color. + Bonus Kanto region starter! Shortly into the game you are given the choice of additional Pokemon: Bulbasaur, Charmander, or Squirtle. Why…? Just because, I guess. – Character movement is pretty wonky and trying to get into specific areas or talk to people can prove more difficult than you’d imagine. As soon as you get your rollerskates you can activate them with the circlepad and zoom around with 360 degrees of movement but you cant run through grass. Pressing on the D-pad will make you walk around with the whole up, down, left, up-right, etc 8-directional movement system and you can run (through grass as well) by holding ‘B.’- There doesn’t seem to be a whole lot of new Pokemon. Most of what we have encountered so far are familiar faces like Caterpie, Bidoof, Pikachu, etc. What is new, however, is pretty cool and interesting. I suppose it comes down to the whole quality versus quantity debate. Still, I would like to see more new Pokemon. – The 3D depth effect isn’t so hot. The game is mostly presented with the two-dimensional effect but in certain instances and in battles it activates the depth effect. It’s not that it looks necessarily bad but it does make the jaggies stand out more and there is VERY noticeable slowdown during battles unless you turn it off. It’s probably best to just completely turn off the 3D depth effect, which seems to be a trend in 3DS games lately, as it makes the entire experience better. Pokemon X and Y are worth buying. Many of you have already asked us whether or not this game alone justifies buying a 3DS. Our answer is yes. However, if the full 3DS price seems a bit high, why not give the 2DS a look? It costs less ($70 cheaper) than the 3DS (especially the 3DS XL which is the better 3DS to buy) and gives you the best of the new Pokemon game. If you’re thinking about playing any other 3DS games, and there are some great ones out already and coming out soon, then go for a full 3DS XL. Follow our entire Pokemon adventure as we once again try and Catch ‘Em All! Hmmm. I hadn’t even realized that the 2DS was out yet. I have owned 2 3DS including an XL but in the end I always kept the 3D slider down because I just didn’t care for the viewing angle. I had heard rumors of a 2DS that would support 3DS games in 2D but didn’t realize it was out or even really happening. I might have to pick up another one to play along with my daughter on her 3DS. And she loves playing Pokemon so might be a good time to do so. Yep they are now available. If I could pony up the $130 I would totally get one. I keep my 3D off almost all the time.